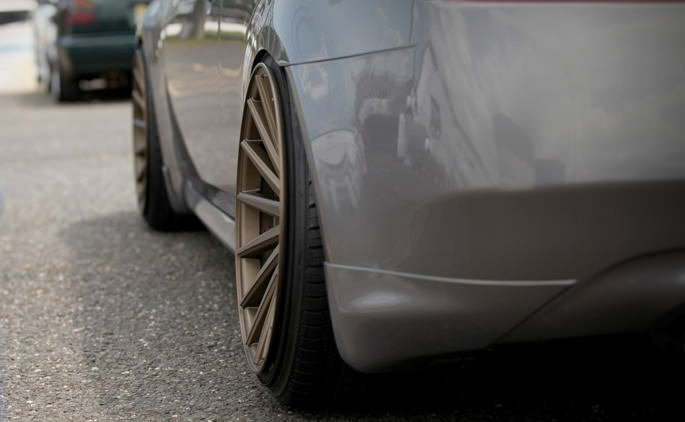 A staggered wheel fitment is definitely not for front wheel drive vehicles, but for rear wheel drive they offer a way to optimize performance in certain models. For example, many Porsche rear engine cars may benefit from having larger or wide rear wheels which can help overcome the vehicle’s tendency to over-steer and keeps the rear wheels from swinging out wide after completing a turn. Plus, because of the weight it actually helps to transfer more of the engine power to the pavement. For cars that are front-heavy, yet possess a rear wheel drive there is a tendency to either over or under-steer depending on the acceleration and sharpness of the turn. However, many drivers actually prefer having a little bit of over-steering where the rear wheels just start to skid out before the front wheels lose any grip. This feeling signals to the driver the limits of the vehicle in terms of how it handles turns and acceleration, so they can anticipate changes. Interestingly enough, having a vehicle that is perfectly balanced in terms of weight is actually quite detrimental. Once either the front or rear wheels lose their grip, they all lose their grip at the same time. Under these circumstances, there is very little the driver can do to get back control until the car slows down. At that point, a driver will be lucky the vehicle does not crash into something before that happens. For rear wheel drive vehicles, having a staggered wheel fitment means enjoying better control of your vehicle when it comes to sharp turns and acceleration. You will have more control over the vehicle and the sense of when things may be going wrong while still having the time to make corrections. Plus, you can always try out different fitments to see what works best for your needs. However, keep in mind that front wheel and all wheel drive vehicles will have their safety compromised by trying to use a staggered wheel fitment. A staggered fitment can destroy the powertrain of a four wheel drive vehicle and cause the car to react in unexpected ways which can put you and your passengers in danger. Whether a staggered wheel fitment is right for your vehicle, you should consider how aftermarket car accessories made from carbon fibre will affect your car or truck. You can choose such carbon fiber parts as spoilers, grilles or grills, bumpers, lip, trunk, hood and many other custom modifications or mods. Carbon fiber is stronger than steel, yet much lighter and more impact resistant as well. For those who want to improve the performance of their vehicle, carbon fiber aftermarket parts are the way to go.